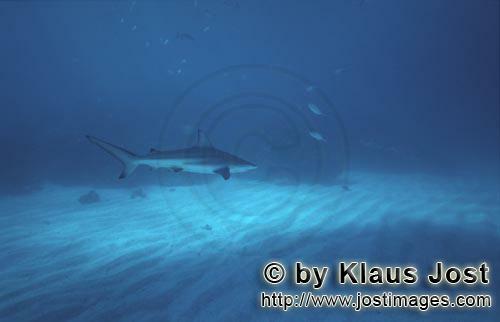 <Blacktip Sharks (Carcharhinus limbatus) live near the coasts in tropical and subtropical seas. They reach a size of up to 2.6 meters and are found in depths of up to 30 meters. At the “Shark Rodeo” near Walker’s Cay, Abaco Islands, at the northern edge of the Bahamas, you can often see some blacktip sharks in addition to the many Caribbean Reef Sharks. The stock has been reduced so drastically by worldwide overfishing, that they belong now to the threatened shark species. Blacktip sharks feed on sardines, herrings, mackerels, flat fish and other fish.